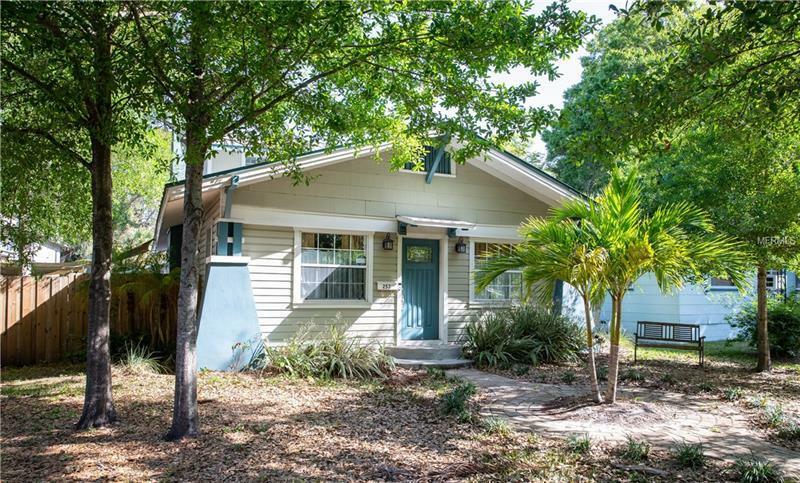 Classic Airplane Craftsman Bungalow located in Historic Old SE just one mile to downtown St. Pete! This home has been completely modernized inside yet still maintains that historic feel with extra wide brick paved streets and a short walk to Lassing Park and beautiful views of the Tampa Bay and the skyline of downtown St. Pete and downtown Tampa. From the moment you open the front door, you'll be impressed by the size of the Great Room which also features a wood burning fireplace. The open floor plan flows directly into a beautifully designed kitchen with a patio door leading off to the side yard. The master bedroom is also located on the main level with it's own patio door accessing the other side of the house. The master bath is roomy and beautifully done. The 2nd bathroom, laundry room and additional bonus room are located on the first floor as well. There are also 2 bedrooms on the 2nd level. The detached garage has been converted to a Cassita with full kitchen and bath and additional storage making it ideal to use as a home office, rental, or an in-law suite.